And We’re Off…To Brockville ON??? An early lesson in being flexible and ‘going with the flow’ has us visiting lovely Brockville Ontario for a couple of weeks before we head out on the world tour. We learned last week that J’s dad is having some surgery and so decided to head out east for a few weeks to see him through it and help J’s mom get him back on his feet. It adds another stop onto our tour, gives us a chance to visit with family and friends we weren’t going to see, and teaches us early on to not be married to plans and itineraries – everything can change. Consequently, this stepped up our departure date by five days so this last week was a whirlwind of finishing work, packing up, visiting, partying and saying good-bye. It went by quickly, which is good…I’m a rip the bandaid of fast kind of girl. The parties were amazing – I was overwhelmed by how many people came to see us. And all the nice things people have to say. It is a great feeling to be leaving and know how many people are proud of us, and support us, and love us, and will miss us. We will miss you all too and will think of you all often as we travel. We’re excited to be on our way, anxious to see what the future holds, and lucky to be able to find out. 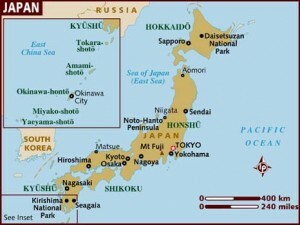 Japan is the last place to visit in our current itinerary. I say current itinerary because, although we have a plan as to where we want to go, the itinerary is certainly subject to change. A plan is only necessary to know what we are deviating from should we change our mind. Japan is expensive. Certainly far more expensive than any of the other countries that we’ll be visiting so, I imagine, that it will take some serious planning to be able to afford it. So this is just a loose idea of where we would like to go – in the end we’ll see what the budget allows. 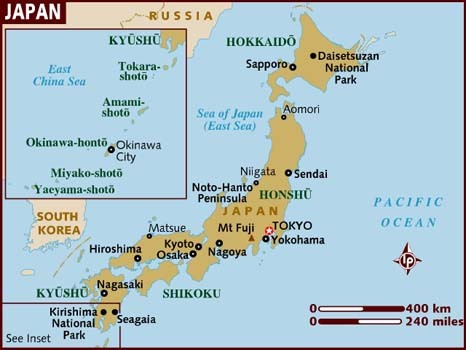 Japan is also one of the countries that I am most interested in visiting. It offers such a dichotomy of technological advancement and ancient tradition. I think our route will show us both. We’ll start with the technologically advanced portion of the tour…in Tokyo. Here, Shinjuku Station is the electronically-jazzed, neon over-loaded, crazy-busy Japanese version of Times Square. Two million people a day pass through this square – and they all seem to know where they are going! Not that Tokyo doesn’t have its share of tradition too. The Tokyo National Museum is here and offers a budget friendly free guided tour. There is also the Imperial Palace to learn more about the Royal Family and plenty of temples and toriis to visit too. Two food favourites will be visiting the Tsukiji Fish Market early in the wee hours of the morning and then one of the many yakitori-ya’s late in the evening for a bbq snack and a beer (Anthony Bourdain loves these back alley watering holes!). And we haven’t even touched on sumo, Harajuku, Kabuki theatre, shopping, and baseball…all that only if we could possibly navigate Tokyo’s extensive subway system…wish us luck! We’ll leave Tokyo (maybe by bullet train?) and head into the countryside to see the other side of Japan. The goal is Kyoto, but first we’ll head to Fuji-Hakon-Izu National Park where Mt Fuji looms in the horizon. It is possible to climb Mt Fuji!! I’m not sure the weather will be permitting in May but maybe we can get part way up anyway. The park itself is beautiful, complete with hot springs, lakes and plenty of hiking paths. Kyoto is the old capital of Japan (and was the capital for more than 1000 years). It shows the more traditional side of Japanese life with traditional architecture, temples, shrines and palaces. Here, it is possible to visit the Gion District to see geishas on their way between teahouses and stay in a traditional Japanese ryokan inn with shoji screens and futons. As I said at the beginning, Japan is expensive. 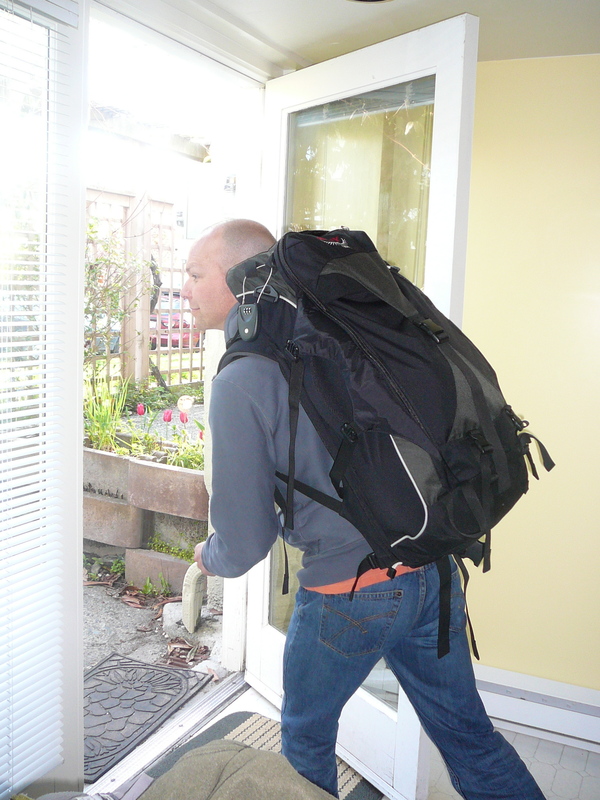 If anyone has any suggestions, recommendations, hints, tips or tricks as to how to visit on a backpackers budget, please let us know. Ok, Can We Just Go Now? I’m done. I’m ready already. I’m prepared. I’m excited. I’m anxious. We have been planning for the better part of a year now and I think we have it all covered. I have lists, and lists of lists. I’ve ticked off almost every item on every list – not bad considering I am usually a serious procrastinator – but, for this, I wanted to be ready. We’ve told all our friends and family. We secured LOA’s from our jobs. We’ve put together the itineraries. The house is sold and the car is on the market. We researched travel insurance and got vaccinations. The packing list is ready (okay, it might need a revision) and most items are purchased. We’ve read countless books and can speak a wee bit of Spanish. We’re ready. There are a few things left on the to-do list but I find myself procrastinating and not doing them because then we really will be done, and there will be nothing left to do…but wait. We’re getting down to all the ‘official lasts’. You know, the ‘official last’ time we’ll visit the local pub, the ‘official last’ time we’ll visit with this or that friend, the ‘official last’ time we’ll drive our car, the ‘official last’ time we’ll go for a ride. Of course, that will quickly be replaced by the ‘official firsts’. 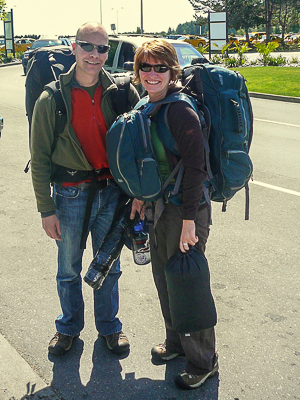 The ‘official first’ time we’ll pack our packs, the ‘official first’ time we’ll set off on an around the world adventure, the ‘official first’ time we’ll stay in a hostel, the ‘official first’ time…well, there will be lots and lots of those. It’s getting harder and harder to develop itineraries. It’s hard to think of being in Vietnam one year from now when we’ll be in Peru in 5 weeks! We come into Thailand after India. As I’m unsure of how I will feel about India, I’ve designed the Thailand itinerary to allow for some decompression which is, I’m told, what Thailand is all about. We plan for 5-6 weeks here so there is plenty of time to settle in and to move around. We’ll fly into Bangkok and spend just the minimum amount of time to get our bearings and make travel plans for heading south…to the beaches. Reading the guidebooks, and talking to friends who have been there, shows that there are countless beaches to visit. It is nearly impossible to choose while reading a guidebook sitting thousands of miles, and a number of months, away. We’ll need some local and traveler expertise while on the road to help us make the final decisions. Although it seems that one can’t go wrong by choosing any of them. There are a few ‘must sees’ it seems. The island of Phuket, the Phi Phi Islands and Krabi draw many people to their shores – there must be a good reason for it. Beaches, parties (although we are a little long in the tooth), snorkeling, rock climbing and general ‘chilling’, all have appeal. 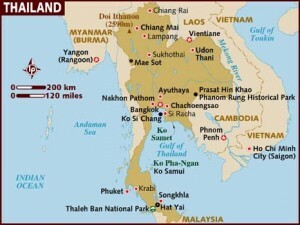 Once we’ve had our fill of the beaches we’ll head back to Bangkok to enjoy the thriving metropolis that it is. Many travelers would avoid the city like the plague, but we enjoy cities and so will spend longer here than perhaps the average traveler might – maybe up to a week. Bangkok has all that any city has to offer with the addition of some wicked markets – the floating market, and the night market. I’m also interested in seeing Wat Po – the reclining Buddha. There is, obviously, much more to see – we have plenty of time to discover all of it. Once we’re done with the city we’ll head north, probably by train. 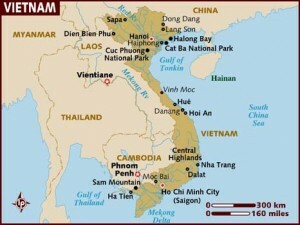 We’ll be heading to Chang Mai stopping along the way wherever we feel like it. Chang Mai, Chang Rai and the surrounding areas offer plenty to see and do. We can explore the ancient walled city in Chang Mai, take cooking classes to learn how to make the amazing food, relax with a Thai massage, visit countless temples and head into the hills to do some trekking. 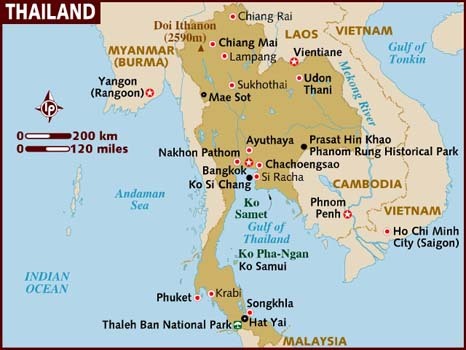 I’m looking forward to Thailand for the relaxation, easy traveling, the famously friendly people, the great food and the beaches. From what I hear it is a very difficult place to leave. India is a place that has facinated me for many years. I am, at the same time, excited to finally be going, and terrified of what it holds and how I will react. 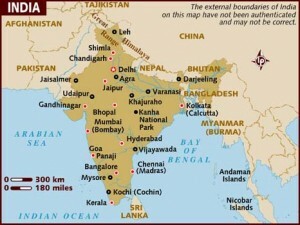 Ten weeks is not very long to spend – we have friends that spent 6 months in India alone! So we have limited ourselves to the north for this trip. A few weeks ago we went to see a talk about trekking in Nepal put on by a local, Vancouver Island fellow. Since seeing that, and reading more about our friends time in Northern India and Nepal, we have pretty much decided to add another two weeks to our time here in order to see a little of Nepal also. Our plan is to start our holiday in Turkey toward the end of September and stay until the end of October – should be almost 6 weeks. 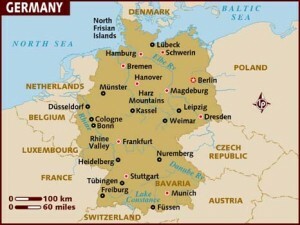 With only 3 weeks to spend in Germany, we will have to be selective in what we see in order to travel at a relaxed pace, see some urban and country sights, and to include some family visiting in too. Although we haven’t firmed up plans with family connections yet our hope is that our, and their, travel plans will sync up and we’ll be able to visit with them. We are also still hopeful that J’s parents will be able to join us as they are experienced in traveling here. Barring that though, we will still plan on visiting the same areas as there is much to see and do.